Skared Wite Boy is attacking you! One of the most iconic parts of Ultima Online (at least in the early days) was the fact that if you weren't in a town you were not safe. UO had the concept of a truly open world where if you did not have the safety of the town guards to protect you, other players would (and did) attack, rob, or kill your character. Often times all three! This was one of the best and worst things about this game. It provided a sense of excitement and realism that I have not experienced to the same degree in any other game since. If a player decided they wanted to partake in acts of thievery, attacking or killing other players (aka Player Killing or PK'ing) would find their normally Blue hued name tag turn instead to Grey signifying they have recently committed some crime. A player with a Grey colored nametag could be freely attacked by other player's without penalty even in the relative safety of town because they were considered a criminal. After a short while however, a Grey player's name would return to Blue, and they could no longer be attacked without penalty. But if a player repeatedly kills other players then their name would permanently turn a Red color. These players were called PKs, or Player Killers. To this day I have not experienced the simultaneous panic and dread like adventuring in Ultima Online when unexpectedly and unprepared you see a Red name appear on the edge of your screen. As another player comes within a screens distance of your character their name will flash on screen signifying their presence. I was always a very timid player and would panic and run, hide, or use magic to escape as fast as I could anytime I would see a Red player name. 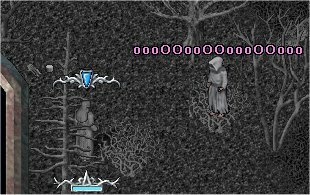 If you die in Ultima Online, your player turns into a ghost and your body - with all of your precious equipment and items - drops dead at the spot you died until you can return back to life and retrieve your things. This was something I considered a worst case scenario, as anyone could freely loot a dead body just lying around. This was of course considered a criminal act in the game, but in the wilderness with no one around... who would ever know? You could loot the body and your name would turn grey for a while but you could easily hide until it turns blue again and make off with all of the items untouched. I worked hard for my items and I don't want another player just coming and taking my things! The feeling of horror you would get as your character is being hunted down by another murderous player who wants your items is nothing short of amazing. Your heart pounds and your hands shake as you race for your life to escape. Terribly horrifying, though still amazing. Working for hours, days or weeks building a character up and working towards getting an expensive set of armor or weapon only to have every single item stripped from your avatar's lifeless body while you helplessly spectate incorporeally is both nauseating and inspiring. My first death at the hands of a PK will be always stand as one of my most memorable gaming experiences ever. When you are a ghost, anyone who is alive cannot understand you when you talk. Instead all they see is "oooOooOOO00o0ooOOo"! To help defend themselves, many players would adventure in groups for added safety, other players would learn how to fight, still others would seek out the help of a strong and fearsome pet, and then....there was me who would run at the slightest sign of danger and therefore never needed to learn how to defend myself. This would eventually change later in the life of my avatar, but until then I was a naive, defenseless 10 year old with big dreams and a trusting disposition. I also didn't have any experience with PKs and hardly even know what one was. Of course I had heard the horror stories from other players but thought of them as distant tales from distant lands and I surely need not worry. As I would soon discover, this was not the case. You have successfully hidden yourself. One method of finding safety was through the use of a skill called Hiding which if used successfully would allow the player to become invisible to everyone provided they did not move. This was incredibly useful but not foolproof, for example if you were standing near another player and used the skill you could still hide successfully but that player would see where you were and could use another skill called Detect Hiding to force your character out of hiding. Alternatively if you did not have the Hiding skill a magic using player could cast the Invisibility spell, which would have the same affect but with a limited duration of around 5 minutes. Another useful skill was the Stealth skill, which allowed a hidden player to actually move while staying hidden. This was an extra layer of security because not only could you hide from dangerous players or monsters, but you could safely and effectively move through dangerous areas, albeit at a much slower pace. These skills allowed my character to cast powerful magic spells, escape dangerous situations, play music to calm the creatures of the realm and then tame them into my control. The perfect set of skills to aid me on my journey to become the most powerful tamer that Britannia has ever seen! As Shadow made his way across the clearing the previously clear skies darkened unrealistically as thunder rumbled and lightning snapped through the sky. Distressed but not deterred Shadow booted his horse into full gallop. The wind howled and tempestuously whipped his cloak as the sound of hooves thundered alongside the pounding rain. After a seemingly endless sprint towards the mouth of the cave Shadow abruptly hauled on the reigns and his faithful steed came to a stop just inside the entrance. The roaring of the wind and rain faded away ominously as he stepped further into the cover of the mountain, so quickly in fact that Shadow turned around to observe the phenomenon. The cave hadn't just diminished the sounds of the environment outside, the weather had changed entirely. Instead of a nightmarish downpour, the sun shone brightly and the birds were singing. A gentle breeze rustled the leaves of the trees and the ground was soft and dry, yet Shadow and his belongings remained soaked. Not for the first time on this journey Shadow felt that something was amiss. Checking his pack and equipment one last time he decided he is finally ready and begins moving into the dungeon. As his foot touches the rocky dungeon floor without warning he is plunged into utter darkness. All sound or light from the outside world is cut off and his senses are bombarded with the rotting stink and skittering sounds emanating from the cavernous darkness looming before him. Fully prepared for this Shadow casts his night sight spell In Lor which fills the chamber with a warm ambient light that keeps the pressing darkness at bay. This is where the true challenge begins. Shadow's destination is the 3rd level of the dungeon where his quarry - a nightmare - is said to reside. To reach his goal he must navigate the winding maze of passages, avoid deadly traps of fire and poison, and make it past the terrible creatures that dwell within. Even though he has practiced this journey many times before, it is no less perilous than the first time. Keeping his wits about him he unpacked his lute and rode forth softly strumming the tune of "Stones". So long as he remained playing his song masterfully the fierce creatures should be lulled into a sense of peace, and ignore him as he makes his way along. As the passageways wound on continuously deeper into the depths of the mountain Shadow crept carefully past the rooms filled with Gazers and Dread Spiders. He narrowly avoided the attention of an Elder Gazer as he was exiting their chamber when he accidentally set off a poison trap and his finger's slipped causing him to miss a single note. Luckily it seemed as though the hellish Gazer otherwise occupied and Shadow slipped past with only some light damage from the poison. He was able to cure the poison away and heal himself up with his magic and continue on his way. As Shadow approached the entrance to the 3rd level of the dungeon which was on an upper part of the mountain carved into the side, he paused for a moment to gather his things and ready himself. He knew that just inside he would come face to face with his destiny. This is the moment he had been working towards for so long, and the moment that would solidify his claim to untold fame and riches in the world of Britannia. Shaking out his nerves and taking a deep breath he mounted his horse and - wait, someone else had just appeared exiting the 3rd level! A player named SkArEd WiTe BoY and his name was red.